Keyword Research is essentially the brain to every SEO project. Doing proper research to determine which types of keywords most suit your online objectives is the key to SEO success. In this post, we’ll be looking at the importance of keyword research and how to properly conduct a simple keyword analysis. This will be a great read for small business owners who want to get a head start on their SEO projects as well as do a bit of manual work to improve early SEO efforts. Without finding the most relevant and cost-effective keywords for your website, you are essentially missing out on all these factors and more. Is the keyword relevant to the website or webpage? Try to only include keywords which you think are highly relevant to your webpage’s topic. Doing so will improve your chances at attracting highly targeted traffic. This will result in higher conversion rates as well as increased sales. Another idea to keep in mind is that if your website is primarily a built to sell a product, you may consider looking into keywords which include the word “Buy” or “Purchase”. Eg. Buy exercise bike, buy bikes online. Does the keyword contain sufficient search traffic? Ideally, as a small business owner you’ll only want to include keywords which have the best chances at providing a positive ROI. Keywords which contain a fair few search queries per month may require a higher SEO budget. For most businesses, we recommend optimising for keywords which possess 0-3000 exact match local search volume per month. Keep reading and I’ll explain exactly how to locate and find these types of keywords. How competitive is the keyword? In most cases, keywords with high monthly search volumes have many businesses fighting for first page rankings. A basic way to determine how competitive a keyword is by looking at the number of indexed pages that show up when conducting a simple search in Google. The higher amount of search result pages, the more competitive it is for that particular keyword. We’ll now drill a bit deeper into finding the most appropriate keywords and how we can group them. Firstly, you’ll want to categorise your keywords based on how a user conducts their search query. In addition, you’ll also want to consider what they would be hoping to find by using their chosen search queries. Below I’ve outlined the two specific categories and how selecting your keywords based from these groups will ensure you achieve your online goals as efficiently as possible. Head Keywords: Only contain 1-2 words. These keywords usually generate the most amount of searches but are highly un-targeted and very unlikely to convert. Examples of head keywords may include, Marketing, Website and Amazon. The number of searches for these keywords usually vary from 200,000 and over. Body Keywords: Usually contain 2-3 words. These keywords are slightly more targeted then head keywords and provide a better idea of what users are expecting to find. Eg. Marketing Companies, Sydney Pet Stores and Melbourne Limousine Hire. Body Keywords vary from anywhere from 1,000-200,000 exact searches. Tail Keywords: Typically key phrases which contain anything from 3 or more words. Tail keywords possess the least amount of searchers compared to head and body keywords. However, they have the highest chances at conversions when used effectively. Examples of these may include Web Design Company Sydney, Limousine Hire in Sydney, Professional Marketing Consultant Sydney. Tail keywords typically contain under 1000 exact searches per month. Navigational Keywords: Keywords or queries made to find a particular website or brand. These types of keywords are used primarily for their navigational ability. For example, a user might be looking to find a particular website and conducts a search to find “Samsung” or “Toyota”. Informational Keywords: Keywords which typically generate the most amount of search result pages. These keywords are conducted with the hope to find a website which will provide the answer to a particular question. This would include: tips, how-to guides, step-by-step guides, news articles and reviews. Eg. “Samsung TV”, “Toyota 86 Reviews” and “How to fix my iPhone”. Transactional Keywords: Keywords which possess the highest value of business ROI – commonly known as money-keywords. Users conduct these queries with the intent to shop or purchase. In other words, they’ve already been through navigational and informational websites and are now looking to make the final purchase. Eg. “Samsung Galaxy S4”, “Toyota 86 Sydney”, “Affordable Car Hire Sydney”. Keeping in mind the types of keywords from above, the next step would involve brainstorming a handful of keywords which you think would prove most relevant to your website. 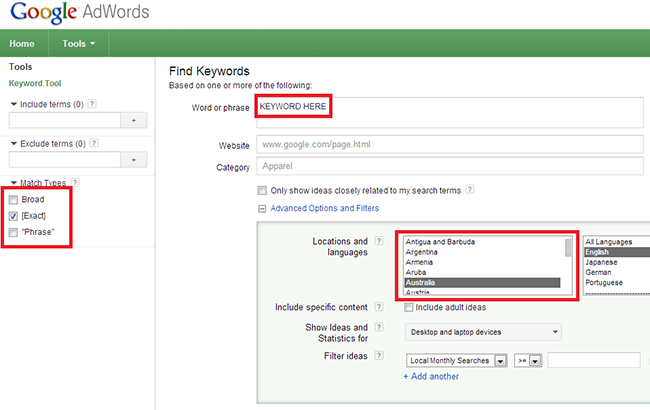 Once you’ve compiled a handful of keywords, use Google’s Adwords Keyword Tool to expand on your list. Referring to the image below, you’ll be required to edit a couple of settings in order for the tool to display accurate results. Once you’ve completed this process, hit search and the results for your keyword will appear. Browse the results list and you’ll more than likely be seeing a list of the types of keywords we’ve talked about. Scan through the list and make your selection based on the objective of your website and what you’re hoping to achieve by having the user find you. Create a landing page especially targeting the keywords you’ve selected. Have the pages optimised and begin with executing your link building strategy. You’ll be ranking in no time! For more useful free keyword research tools, I recommend you also check out Wordtracker, Keyword Discovery, Wordpot and UberSuggest. Any questions, feel free to leave a comment below. For more information about our SEO services please contact me at daniel@bigvisionmarketing.com.au.